Breanne Williams. 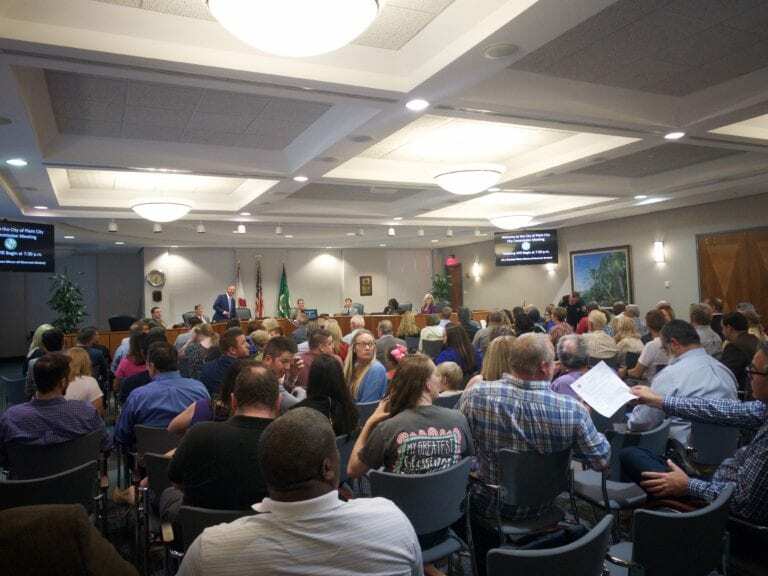 The commission meeting was filled to capacity Monday evening. The wait is finally over. Plant City’s alcohol ordinance has officially been altered, allowing small spaces in the heart of downtown and Midtown to now serve beer and wine on their menu. There were only eight empty seats in the Sadye Gibbs Martin Auditorium Monday night as the community gathered to discuss many important topics, including the city’s proposed amendments to the alcohol ordinance. Essentially the changes create a clear-cut definition of a bona fide restaurant and allow the sale of wine and beer in businesses that were not the previously required massive, full-sized restaurants that only fit into a handful of locations downtown. This was the second of two public hearings and while the majority in attendance stood to show their support of passing the change, two stepped up to the mic in opposition. J. Myrle Henry, an inarguable foundation of the community, began listing statistics of those struggling with alcohol use disorders in the country. Using his background in pharmacy he painted a picture of the life altering events that can occur due to the inebriated actions of those who abuse a bottle. That’s where the opposition ended and three local residents — all of whom are involved with Plant City Main Street in some capacity — stepped up to the podium to voice their support of the change, echoing dreams of economic vitality in downtown. Nick Thurston, president of Main Street, said the goal of the organization was entirely to revitalize Plant City’s downtown. When they met in December to discuss what the community hoped to see change in downtown there were four key items brought to the table, one of which was altering the alcohol ordinance. Plant City had been living in the past, Thurston said, and they simply wanted to see the ordinance match the ones held in cities all across Tampa Bay and nearby communities. If Plant City became consistent with other governments it could potentially see the growth that is flourishing in nearby communities. Ronni Wood, a coordinator for Florida’s Main Street program, shared statistics to back up that claim and said our state was entering a new wave of living. The key to opening the doors to that burgeoning movement is to ensure the local government had policies that encouraged economic vitality in a downtown district. Every commissioner at the dais voiced their opinion on the proposed ordinance following the public hearing. Many shared their love and respect for Henry while also saying the old policy — which was adopted in the 1990s — had served its purpose. Commissioner Bill Dodson said it was “past due for revision” and said as civic leaders it was their duty to ensure their community could have everything it needed to provide growth. His fellow commissioners agreed. Commissioner Mike Sparkman said the change would put merchants downtown back on an even playing field. He hoped the new ordinance would help breathe new life into downtown and bring it back to the viable atmosphere it was in the 50s and 60s. The vote was unanimous and the change was effective upon passage.